Friday has rolled around again, so I present to you the latest edition of The Friday Five! If this is your first time checking out The Friday Five and you’re wondering what it’s all about, this is a feature that I post every Friday in which I give my thoughts on a topic that’s related to basketball video games, the real NBA or another area of interest to our community, either as a list of five items or in the form of a Top 5 countdown. We’re now just a few weeks away from the start of the 2013/2014 NBA season. With Derrick Rose back in action, an extra game on ESPN Australia every week and a lot of interesting match-ups and subplots to look forward to, I’m already getting excited for a new year of basketball. Before the 2014 season tips off however, I thought I’d take a look back at some of my favourite seasons from years gone by, a couple of which aren’t actually years where the Chicago Bulls won the championship. So, without any further ado, here is a countdown of my Top 5 Favourite NBA Seasons. This probably isn’t a very popular season outside of the Miami Heat’s fanbase, of which I am not a member, but all the same it’s still one that I really enjoyed. I’d subscribed to Foxtel back in September 2004 and ESPN Australia made some improvements to their coverage for the 2005/2006 season, which was most welcome in helping me get my NBA fix. The Bulls were on their way back up and Ben Gordon was becoming my new favourite active player (though these days, that’s Derrick Rose). While I believe in supporting your favourite team through thick and thin, at the same time enjoying what the rest of the league has to offer, it always helps when your favourite team is at least respectable and you have a favourite player or two to take an interest in. When it comes down to it, I think it’s safe to say that it’s the NBA Finals series itself that is responsible for this season tending to be unpopular with people who aren’t fans of the Heat. It certainly wasn’t without controversy, but I actually enjoyed it for the rarity of seeing two teams that were both making their first NBA Finals appearance. I’ll also admit that I wanted the Heat to win, just as I wanted the Mavericks to return the favour five years later. Looking back, the 2005 and 2006 seasons both went a long way in rekindling some of my enthusiasm for the NBA that perhaps wasn’t always there after the Bulls Dynasty ended, though of the two I probably enjoyed the 2006 season a little more from start to finish. Therefore, it gets the nod here. In compiling this week’s Five, I did aim to limit the number of Bulls championship seasons as much as I possibly could. I also wanted to make sure that I included at least one fairly recent season that I really enjoyed, so that the countdown wouldn’t be completely awash with 90s nostalgia. However, I can honestly say that the 2010/2011 season stands as one of my all-time favourites and I’m comfortable with ranking it ahead of the Bulls title campaigns that I left off this list. Of course, there is admittedly still some Bulls fan bias here. Chicago had the best record in the league for the first time since the 90s and Derrick Rose had a great season that saw him take home MVP honours. Of course, the Bulls would ultimately come up short against Miami in the Playoffs, but fortunately we got some really good games from pretty much the entire league throughout the year. 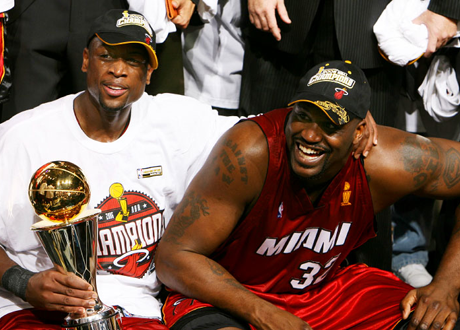 I also really enjoyed the clash between the Heat and the Mavericks, indeed picking it as one of my Top 5 Favourite NBA Finals Series in an earlier countdown. Great games, a memorable championship series and several new stars emerging and solidifying their place in the league…it was a fine season for the NBA, one of the best in a while. It’s just a shame it had to be followed by the third lockout in league history, the second to result in games being lost in the following season. The first Bulls championship season that I’m featuring in this countdown also happens to be their last. That alone makes it memorable and one of my favourites, a fitting conclusion to that era in Chicago Bulls basketball, but 1997/1998 also stands out as the first season that I was able to follow along with closer than ever before. My family finally got connected to the Internet in August of 1997, so I no longer had to wait for weekly doses of NBA coverage, not counting the occasional article in the local paper or snippet in the evening news. Now I could keep up with the latest stats, standings and results, find out about news the day it happened, vote for the All-Stars and even struggle my way through short highlight videos, any day of the week. Ah, dial-up! 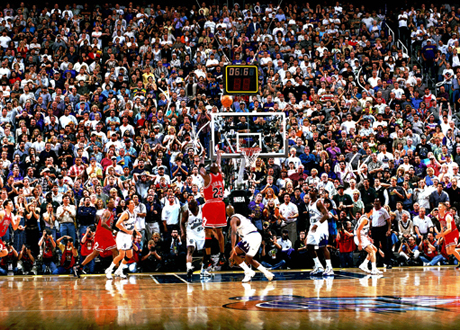 While the Bulls’ sixth championship solidifies the 1998 season as one of my favourites, I think that the sense of urgency and the hope that they could pull it off and go out on top that I felt throughout the year really makes it stand out in my mind, especially given their slow start. While it was tough to see the Bulls Dynasty come to an end, it was an interesting time in the league with the young stars of the day really beginning to make a name for themselves and a new era looming on the horizon. It isn’t my favourite season, but I enjoyed the ups and downs, getting an even bigger NBA fix online and ultimately, one last championship for the Jordan and Pippen-led Bulls. As such, it cracks my top three. 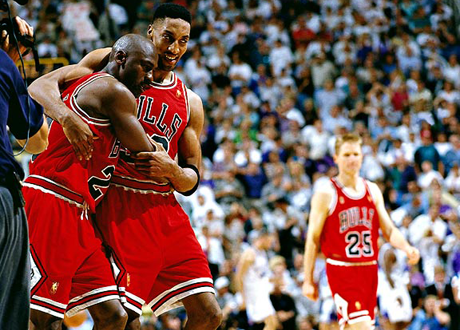 Yes, another Bulls championship season, one in which they started 12-0 and fell just short of 70 wins while producing several classic moments, including MJ’s Flu Game against the Utah Jazz in the Finals. However, it was also a significant season for the NBA in general as the league celebrated its 50th anniversary, marking the occasion by naming its 50 Greatest Players in a ceremony during halftime of the 1997 All-Star Game. It’s an event that in my opinion is still goose bump-inducing to this day. In addition to interesting developments such as Shaq going to the Lakers, Charles Barkley joining Hakeem Olajuwon and Clyde Drexler in Houston and Don Nelson’s wheeling and dealing in Dallas, we had the Draft Class of 1996, featuring the likes of Kobe Bryant, Allen Iverson, Steve Nash, Antoine Walker and Stephon Marbury. Several of the established stars were of course still doing their thing and putting on a show. I was really getting into basketball in a big way around that time and I remember the excitement and anticipation that I felt when staying up late or setting the VCR to record the Game of the Week and NBA Action, always hoping it’d be a good one (OK, hoping it’d be a Bulls game) and being eager to catch up on the week’s news and highlights. It’s actually kind of funny to think about now, what with YouTube, League Pass and all the other NBA coverage that the World Wide Web has to offer. In the 90s, Bulls fans experienced six (not one, not two, not three, not four, not five) very enjoyable seasons of NBA basketball, two of which I’ve already mentioned. If I had to pick my absolute favourite though, it would have to be the 1995/1996 season. It truly was a season for the ages; you probably know the facts and figures, but I’m going to list them anyway. 72-10. MVP, All-Star MVP and Finals MVP for Jordan, Coach of the Year for Jax, Sixth Man of the Year for Kukoc. MJ and Pip, All-NBA First Team. 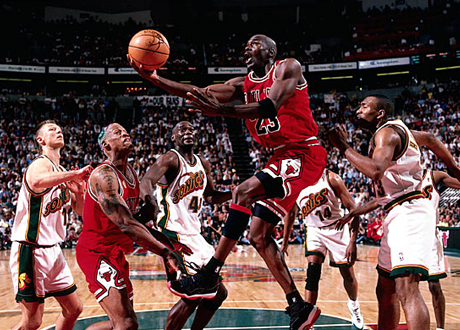 MJ, Pip and Rodman, All-Defensive First Team. An 18-game winning streak. Another scoring title for His Airness, another rebounding title for The Worm. Championship number four. In short, the Bulls flat out dominated that season in pretty much every way imaginable. While the Bulls’ success is a major reason why I still look at 1996 as being my favourite season, there’s more to it than that. It featured the last All-Star game where the stars that came along in the mid-80s were able to participate. Quite a few of those players would be slowed by injuries or otherwise began to decline in subsequent years, making it something of a swansong for their time as the premiere stars of the league. We also had an exciting batch of rookies including Kevin Garnett, Antonio McDyess and Michael Finley, to name but three. Shaq and Penny in Orlando, Kemp and Payton in Seattle, a comeback from Magic Johnson…the 1996 season had it all. In short, it was a fantastic, memorable season, my all-time favourite and the one that I’ve always thought of first when making retro season rosters. Now, if you’ll excuse me, I believe I’m overdue for re-watching the recap on the Chicago Bulls’ Dynasty Series boxset. It remains to be seen whether this upcoming season will become one of my all-time favourites, but hopefully it’ll be a great one nevertheless. In the meantime, that’s going to do it for this week. What are some of your favourite NBA seasons? What would be your top five? Let me know in the comments below and as always, feel free to take the discussion to the NLSC Forum. Thanks for checking in this week, please join me again next Friday for another Five. There’s not much to argue. My No. 4 (1990/91) and 5 (1992/93) would be different from yours, but definitely agree with Nos. 1-3. Seeing MJ wearing his 23 again while leading the Bulls to the best record in the history of the league and to title No. 4 was just great. – 2006/2007: had a personal friend playing for the Bulls and he became a fan favorite, and we swept the defending champions 4-0 in the playoffs. – 2007/2008: while forgettable due to the results I was able to visit Chicago and went to several Bulls games (again, thanks to this friend who payed for all XD)….also we got the 1 pick on that lottery. 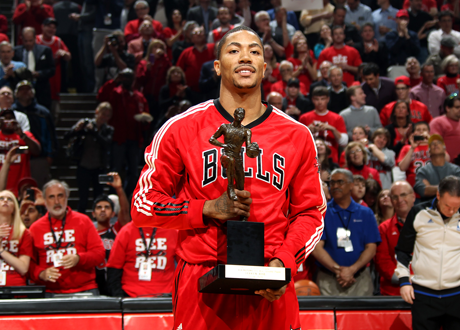 – 2010/2011: the rise of D. rose. – 1995/1996: waiting for someone to beat those 72 games. – 1997/1998: the last dance.